- For a Muslim to become a Christian, he must wait until he receives great Grace, so that he is prepared to be martyred for Christ. If he does not receive this Grace, let him wait. - Someone passed sequentially through Islam, Hinduism, Buddhism and black magic. In all these religions at the same time he did magic. As soon as he became Orthodox, he wanted to practice along with this magic, but he was unable to do it. From this he realized that magic is the foundation of all religions and that religions are dead, their leaders are dead, but Christ is the living God. - For many years exorcisms must be read for those who came from doing magic. This is what the early Church did. - Buddhism has some truths, but it has one human truth, which reaches to "zero", that is, with concentration-meditation man reaches the non-being from which we came from. It is an existential suicide. Christ leads us to theosis, to communion with the Triune God. - Some say that Buddhism has nothing to do with demonism. However, those who speak thus know Buddhism only from books and speak theoretically. Action is different. - Some say that meditation brings them a certain peace. Externally this appears good, but these people are possessed by conceit and this results in carnal warfare. Even if they leave Buddhism, they again have carnal warfare. This shows the satanism of this method. - There is a difference between Buddhist and Orthodox asceticism. In Buddhism they try to make a disclaimer and they reach nirvana. They confuse a reflection with mystical vision. They see created light with their mind. This was best done with Plotinus, in Neo-Platonism. The Fathers know this, and we can call it the "cloud of unknowing", but they went beyond this and reached the vision of the uncreated Light. Then they experience that the Light comes from a Person and not from an idea, and they feel a personal relationship with God and, at the same time, there develops a great love for God and the whole world until martyrdom and "self-hatred". 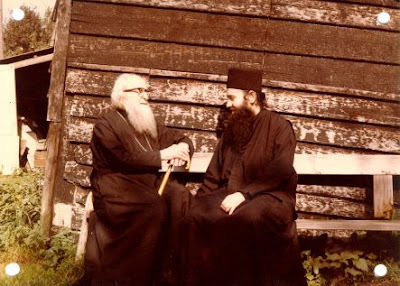 From I Knew A Man In Christ: The Life and Times of Elder Sophrony, the Hesychast and Theologian (Οίδα άνθρωπον εν Χριστώ: Βίος και πολιτεία του Γέροντος Σωφρονίου του ησυχαστού και θεολόγου) by Metropolitan Hierotheos of Nafpaktos and Agiou Vlasiou. Translation by John Sanidopoulos.